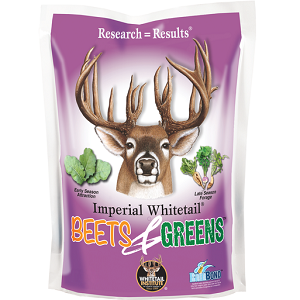 Imperial Whitetail Beets & Greens Deer Plot Seed 3.15lb. Beets & Greens features annual seed varieties that are designed to work together to attract and hold deer throughout the fall and winter. These include the Whitetail Institute’s proprietary kale, turnip and radish varieties, as well as the sweet attractiveness of sugar beets. These components are included in Beets & Greens in ratios that Whitetail Institute testing has proven will provide abundant, highly attractive tonnage from early fall through late winter, as well as tubers to help deer through the harsh winter months. Designed for planting in the fall, Beets & Greens establishes and grows quickly.